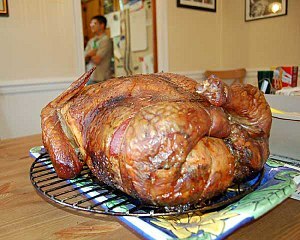 Turducken: a chicken, stuffed inside a duck, stuffed inside a turkey, often with stuffing placed between each layer. Sounds like a monster, huh? In truth, I was hesitant when I first tried one. I was at an Orphan Thanksgiving celebration at a friend’s place and she mentioned she had purchased one. “Blasphemy” I cried, pointing at her viciously. Why would anyone do this? I was so very wrong. That meal was one of the most delicious, albeit strange, that I’ve ever eaten. Centuries ago, the Romans did something very similar with pigs, goats, sheep, cows and other land animals, as well as waterfowl like ducks and geese. In the 1800s, the French had a meal called Roti Sans Pareil, or the Roast without Equal. It featured up to 17 birds, each being stuffed inside another, larger bird. They ranged in size from a Warbler at its smallest to a Turkey and Bustard at the larger end. Truly an aristocratic meal. In more modern days, there are several companies that provide them for varying prices, often including different flavors of stuffing or even replacing it entirely with pork. I would not recommended attempting to make one at home the first time, as each of the birds needs to be almost entirely deboned for ease of cooking and carving, but if you have a butcher that is local and easily bribed, I would highly advise embarking on such an adventure. Turduckens are shipped on dry ice in their own small coolers. They cannot be fried and this warning is apparent on every one I’ve ever purchased. Fire up that oven, make sure the birds are completely thawed and pop it in the oven. Follow the directions that are included with your bird. That’s really about all there is to it. Once completely cooked, remove it from the oven and let it sit for about 20 minutes or so. Being completely boneless makes them extremely easy to carve. Just slice it as you would a pork loin. Each slice will give you all three birds and the stuffing of your choice. My household orders one every couple of years or so and we always make sure to invite new people over to try it. The expression on their faces when we explain what it is we intend to feed them is priceless. Everyone has gone home a convert to the Turducken ways. It is a truly unique experience that I think everyone should have. It certainly illustrates the creativity and fun that can be had with simple combinations of food. If we can’t have fun, what’s the point, right? Find your fun!